The many faces of Frank Morgan, the grand “Wizard of Oz”! While growing up and watching “The Wizard of Oz,” I didn’t realize how many parts actor Frank Morgan played. Did you? Morgan, born Francis Philip Wuppermann, played five parts in this classic movie: the professor, the guard, the gatekeeper, the carriage driver, and the Wizard of Oz! Per IMDb, “W.C. Fields was originally considered for Morgan’s role in The Wizard of Oz (1939). However, Fields haggled endlessly over salary, and the role was given to Morgan.” I can’t imagine anyone else, especially Fields, playing these roles, can you? After my middle sister was born in the 1950’s, it was later discovered that she had a condition which made her very small for her age. Knowing that she might always be little, our mother thought it would help if my sister could meet others like her. For years, we had heard that our grandma was friends with one of the Oz munchkins, who was now retired and living in our city. 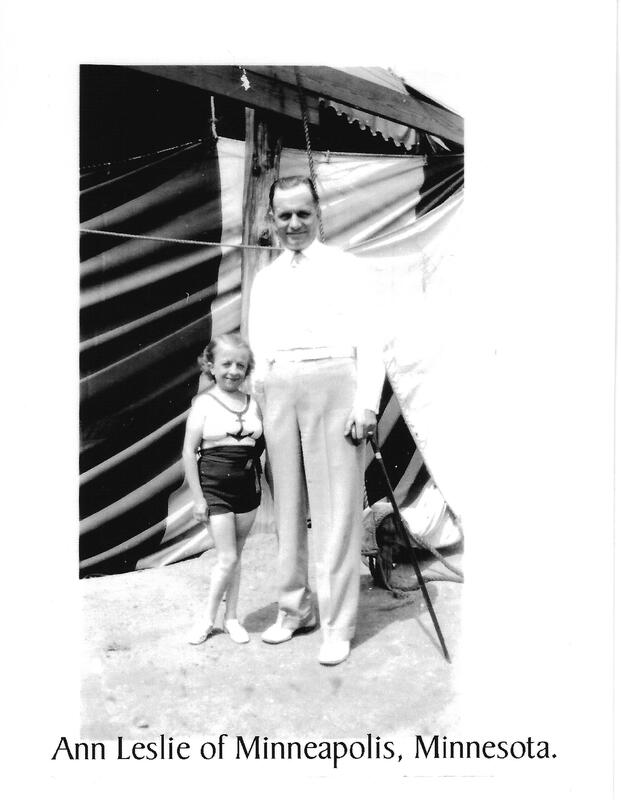 So, Mom jumped on that idea and took us both to visit Ann Rice Leslie, one of the Singer Midgets who performed in the 1939 “The Wizard of Oz.” Mom also mentioned that she had played with Ann’s daughter, Jane, when they were young. We couldn’t believe that we were going to meet a real live actor, a munchkin from Oz! At invitation, we entered Ann’s apartment with much excitement. Ann greeted us warmly, all 3’6″ of her! As I looked around the apartment, I noticed one tiny rocking chair and one huge rocking chair (reminded me of Goldilocks). When asked about those chairs, Ann told us about Fremont, her 6’2″ husband who obviously needed a bigger chair. I was amazed that her kitchen was normal-sized: “he can reach all the high places,” she said. A match made in Oz! We all talked for a bit, letting my sister enjoy being with someone her height, and, like typical starry-eyed fans, we asked some questions; Ann politely answered them all. The one question I can remember was if she had a favorite actor in the Oz movie. Without hesitation, she said it was Frank Morgan (Wizard, Gatekeeper, Prof Marvel, etc. ), and her next favorite was Judy Garland because she was “so sweet to all of us” during the making of the film. A firecracker baby, Ann Rice Leslie was born on July 4th, 1900 in Rhode Island. 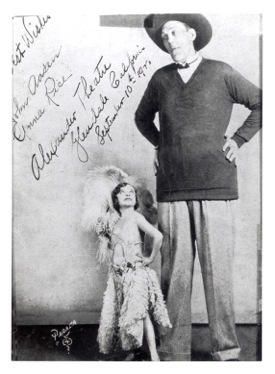 Ann resided in NYC when the Oz movie flyers came out looking for little people. 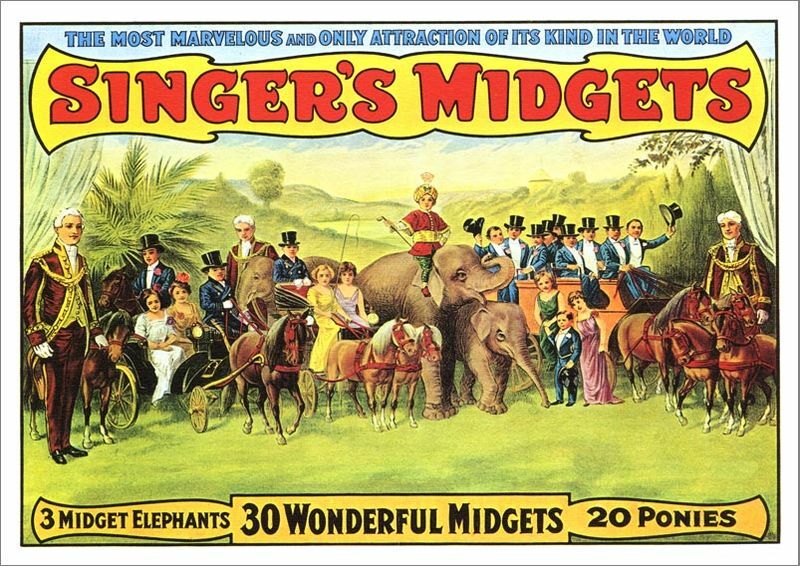 Before the film, Ann was either a member already or became one later in the Singer Midgets Troupe, a vaudeville group formed around 1912. Recently, I was ecstatic to find a 43-second silent film clip of Ann, husband Fremont, daughter Jane, and the family dog at their home in 1931. My uncle used to say that he could pick out Ann in the film, but we never could; we just knew she played one of the villagers. Before we left Ann, she signed my movie edition book of “The Wizard of Oz,” and I realized how lucky we were to meet such a gentle and gracious lady. In 1973, our friend Ann died. The more relaxed side of some not so relaxed movies!